I just finished the installing of crossroads, transpose, and breathe in the ISE Cultural Foundation Gallery, but I still need to install decipher in the University Art Gallery at Stony Brook University. This exhibition will open on September 15th. 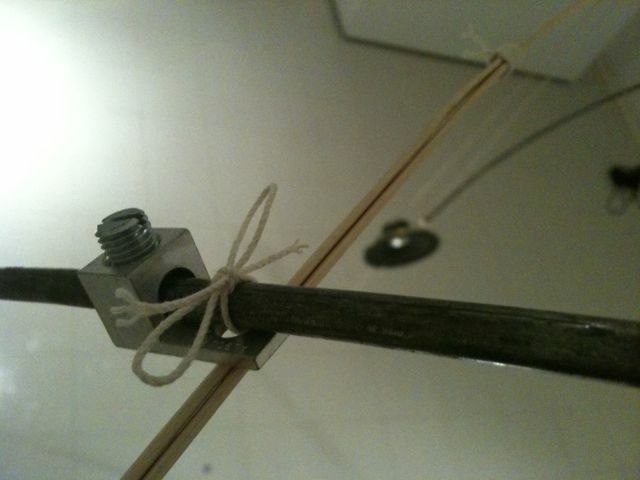 This photo explains how I attach the bamboo rod onto the 1/4″ round rod in decipher. I often tie objects with kite strings. I learn tying technique while I was creating fishing tackles when I was a kid. It is not only simple butterfly like tying, but also many different types. Tying is somehow important in my work. There are many meanings in tying in Japan. Connection, remembrance, preparation and many other meanings. 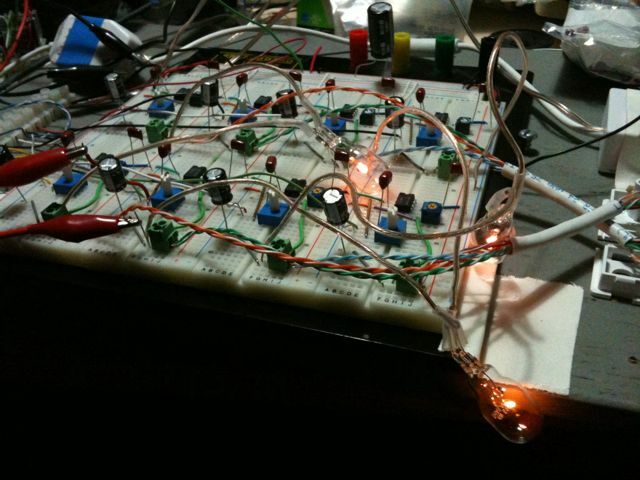 I almost finished to install decipher today, except electronic circuit that I made. I says that I am a sound and light installation artist, but sometimes the sound quality is awful after I installed. Maybe.., the noise problem is caused by the power source in a space/gallery. There are many things that I can’t figure out myself. Here is a experimental circuit for decipher. I try to use 12V naked lamps instead of LED lights like I did in the Second Street Gallery, VA. It seems okay to use up to 3 bulbs, but more than 3 light bulb makes noise and flicker. I changed the capacitors to small non-polarized capacitors. The blinking light looks better, but with 8 of them…. I have no clew to find out. On the other hand, I feel like sound with noise makes more sense to having experience the atmosphere of installation. This is good excuse of my current shows, maybe… But, actually, I had this kind of comments when I showed crossroads in 2007. Anyway, I need to develop more stuff for future projects. This entry was posted in art, exhibition, sound, tech and tagged breathe, exhibition, sound, tech. Bookmark the permalink.